It is an easy last minute dish. The lemon gives such a nice punch of flavor. Season cutlets with salt and pepper, and then dredge in flour. Coat a sauté pan with nonstick spray, add oil, and heat over medium-high. Sauté cutlets 2-3 minutes on one side. Flip cutlets over and sauté the other side, covered, 1-2 minutes. Transfer cutlets to a warmed platter; pour off fat from the pan. Deglaze pan with wine and add minced garlic. Cook until garlic is slightly brown and liquid is nearly evaporated, about 2 minutes. Add broth, lemon juice, and capers. Return cutlets to pan and cook on each side for 1 minute. Transfer cutlets to warm plates. 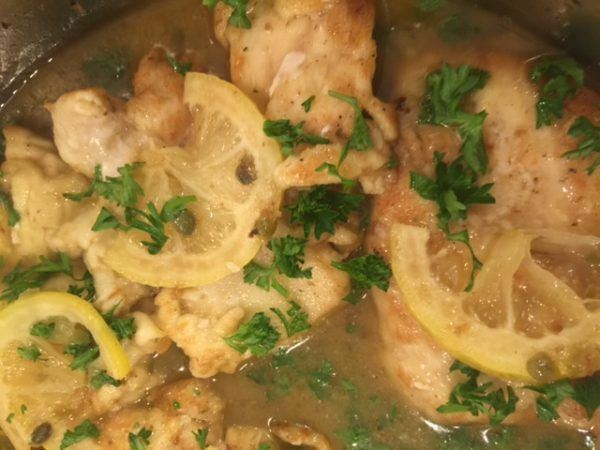 Finish sauce with butter and lemons. Once butter melts, pour sauce over cutlets.